It is supposed that the reader is familiar with our previous articles as the basic ideas and terminology stays the same. The primary goal/task of the analysis of signals OFDM with CP, we consider define of authentic value of factor K - "Magic K", knowing this factor, the rest of it is possible to receive all much more precisely and faster. I will remind, the relation of duration LG(it is a length of a guard interval - CP) in samples, to duration LU(it is a length of usefull, the basic body of symbol without CP) in samples, also there is this factor K, that is K = LG/LU and is dimensionless size that in the turn, leads us in absolutely indifferent which frequency of sample rate(SR) has concrete record. This moment we already wrote in earlier articles. Also it is necessary to remind that full length of symbol OFDM with CP we name LS and it is equal LG + LU. Before practical examples of use of calculator K integrated in SA versions 6.2.6.5 will be considered, let's discuss main principles and ideas of its work. Where x and y the positive integer number. In other words, frequency of SR multiple to clock frequency of manipulation (Br) and to a rating between channels (Sh) is "Native". Here, sometimes it tries to "convict" us in inconsistency. On the one hand we speak about "independence" from concrete frequencies of SR. On the other hand, we speak about "native" and "not native" frequencies of SR, which certainly should have any concrete values. So "native" SR is multiple both Br, and Sh, it means that if what way to receive exact value either Br, or Sh there is a possibility of reception of a grid of frequencies of SR where at least one of them will be "native" where LG and LU will be true. Such approach demands define of range of such grid of SR, and if the lower boundary can be accepted as current frequency of digitization of record, a choice of the upper boundary, generally, a problem not trivial. In current version SA, the upper boundary is accepted as SRcurrent*2. Essential note: frequency of SR of source record should be lowered on so much, on as much as possible, this will strongly lower computing loading to the program and as consequence will be reduced time of the analysis. Choice of the top border as the doubled value of current frequency of SR becomes from following reasons. It is well visible that in this case, practically half of spectrum is empty, it means if to form OFDM a signal for the such conditions it is necessary to recognize that computing resources are spent for calculation considerably bigger quantities of channels than it is really used, at least senseless character has 50 % of calculations. It certainly isn't forbidden, but in practice it is improbable, though and it is possible. Thus, a choice of the upper boundary of a settlement grid of frequencies of SR at level SRcurrent*2 is based on the ssumption that signal OFDM is formed more less rationally, otherwise the accurate criteria of a substantiation of the upper boundary doesn't exist, it can be both SRcurrent*3, and SRcurrent*10, and SRcurrent*55 etc. As in SA, rather precisely it is possible to receive baud rate(Br) OFDM of a signal the list of frequencies of SR is calculated as SRcurrent <= (SRnew = Br*n) <= SRcurrent*2, where n - the positive integer numbers. Then under this list, on each SRnew are measured key parameters of signal OFDM, such as LS/LU/LG, amplitude/power of the correlation triangle, signal shift on frequency etc. As a result turns out the list of "candidates" with the SR/LU/LG and others parameters which demands the detailed analysis and which at least, there is at least one "native SR", and as consequence, at least one correct combination LG/LU. As it is simple to count up, such "candidates" will be LS(as quantity) on the lowest SR, that is, if in source of signal after the preliminary analysis LS = 300 samples the list for the detailed analysis will consist of 300 "candidates". Even if on check of everyone will leave for 3-4 seconds, the general time will be impressive enough. Function of removal is assigned to a pre-processor from this list of obvious outsiders. We have already considered one of methods of reduction of this list, this fall of frequency of SR of an source signal/record. Another obvious enough, this removal of all "candidates" with odd LU, it will reduce the list to 50%, and at last in a pre-processor one more method which allows to remove approximately 40 % from remained "candidates", as a result from 300 "candidates" is used remains approximately 100 which demand the detailed analysis. The detailed analysis should be spent in second half of calculator, this part will be integreted in SA further, that not less main principles of work as we will consider. Actually the main principle of reception "Magic K" is based on consecutive specification of significant digits of this factor. Two first digits is rather easy to receive from pre-processing block, the others demand serious efforts, and these efforts grow in a geometrical progression in process of increasing quantity of significant figures/digits. Check of "candidate" is based on checking of its orthogonality and if in the list most orthogonal "candidate" it LG and LU are considered is found out true, and on them it is calculated "Magic K". From all told above follows that from accuracy of definition of baud rate(Br), depends, which frequencies of SR will be used by the program for search "Magic K" and if in measurements Br there will be an error, also all other steps will be fail. As on short OFDM signals to measure authentically clock frequency basically it is impossible, then and to receive guaranteed K it is rather problematic. Besides, it is necessary to consider and the following nuance. For example, for signal WinDrm "Magic K" = 0.25, and at worst for the calculator, nearest "competitor" on true has the K = 0.253, such difference in 0.003 that is, in the third figure/digit will be accurately enough traced at check on orthogonality, and such "competitor" has no chances. But "Magic K" can be any, and necessarily there will be very difficult signals, where even ideal quality can't serve as a success guarantee. Signal TANDEM has K = 59/256 = 0.23046875, at "competitors" K is easy can differ only in the fifth digit! To distinguish in that case true orthogonality, from "almost orthogonality", very and very difficultly. Nevertheless, even presence only front-end process block allows to receive sometimes authentic enough results. Let's consider some practical examples. We will consider this signal in detail enough, and we will pass all steps described earlier. 1. We allocate a signal with H-markers, and it is transferable chosen range downwards, through function "Direct translation". It is necessary to remember about it. OFDM signals is inadmissible to filter on very dense mask, that is, between H-markers and extreme channels of a signal, the free space in size not less than 2-3 channels should be obligatory. In opposite case absolutely unnecessary distortions can be brought in a signal. 2. After correct carrying over, resample a signal on lower frequency SR. I have new SR as 6782 Hz, You can have other value. 3. 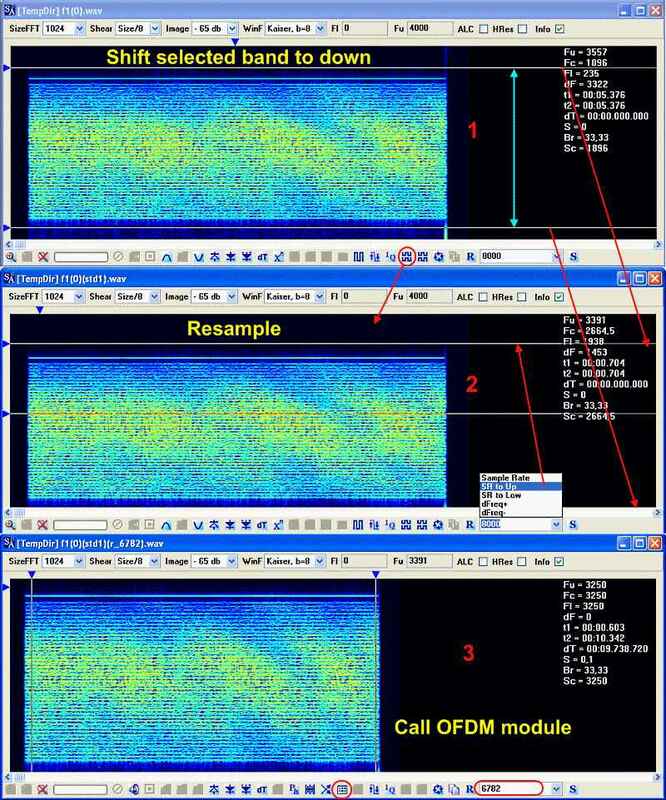 After resample, we select a signal(or part) V-markers and call module OFDM of the analysis. In OFDM module it is possible to touch nothing, and at once to cause "Find CT". A correlation triangle in last versions founds out very quickly. After detection of a correlation triangle, it is standardly caused "ADP" and then "List of K". Approximately through 40-50 seconds, the result of work of a pre-processor of calculator K will be the list of "candidates" on "Magic K" with which to sort it out. By default, this list is sorted by amplitude/power of a correlation triangle, but it isn't necessary at once for us. For the beginnings it is necessary to sort the list by value K. The sorted list is deduced from smaller values K to the big. It is logical to assume that true value of K will be somewhere in the middle, between minimum and maximum values. In our example, K = 7/8 looks not bad enough. It is necessary to be convinced that it is valid the real candidate on "Magic K". Actually at us isn't present what other variants how to sort the list by parameter AM, amplitude/power correlation triangle and if the maximum values specify on K = 7/8, chances that this really true value of K are rather great. As we see in the lead positions (any sorting is always deduced from smaller values to big) occupies K = 7/8. It is necessary to check up only all for what it is chosen "native" frequency of SR for this value of K, actually there are a lot of frequencies. I have preferred the lowest of 6999.87 Hz. Resample an source signal on this frequency (fractional values of digitizations can be entered in this version SA) and it tried to receive in module OFDM constellations in channels. After necessary installations in OFDM module, a choice of model of a signal(B), a choice of the channel and small correction of frequency of shift is possible to observe constellations. - The signal has many channels (45). - In a signal long enough CP, almost same as LU. - Record qualitative enough, isn't present strong selective distortions. - Modulation in channels very simple though it also doesn't play a special role, but for visual check/control it certainly very convenient. Other Chinese OFDM 19 Tone - record. I won't consider it as in detail as previous, in it there is no special sense, as the basic steps and actions differ nothing from earlier described. Just I will show a final part. Actually this signal DRM is curious enough. The matter is that it has very strong selective distortions, and qualitatively to check up it on orthogonality it is almost impossible, nevertheless, K it is defined confidently enough. Certainly, it is not necessary to be under a delusion, the current variant of "semicalculator" isn't capable to help with many cases, for example you cannot guarantee receive K = 17/64, or make the given reason choice between 17/64 and 15/32, it is impossible. In the core, it will be rather good to work on "simple" K, such as 1/2 1/4, 7/8 1/9, 9/16 etc. and that, not always at all. The small videoclip which has been maked on the first signal is applied on article. From this clip, I hope, all aforesaid will be more clearly. In the same clip, in the end, it is shown as to define signal model. This question set in letters regularly. To define model signal generally inconveniently enough, but on signals where in channels PSK, and in relative constellation it is displayed accurate enough picture, it not so is difficult. As it is well visible from a clip if the model doesn't represent the facts, relative constellation at change of the channel, sharply enough and strongly changes the orientation. The absolute constellation changes as sharply and unexpectedly. If the model represents the facts, the relative constellation changes orientation smoothly enough and hardly noticeably. In ideal case it in general is at a stop, in an absolute mode as all is much more predicted as it expected. This the ideal case also is exact conformity of parameters of true OFDM signal, that is when LG/LU/LS/SR and signal position by frequency are defined precisely. Don't forget that there is a mixed model (C) OFDM signals where the pilot tones have one model of formation (B), and all the others channels are formed by A model. © www.radioscanner.ru, 2009-2012; ©miniBB Site Engine | загрузка: 0.026сек.